Up The Buttress – usually in early September. 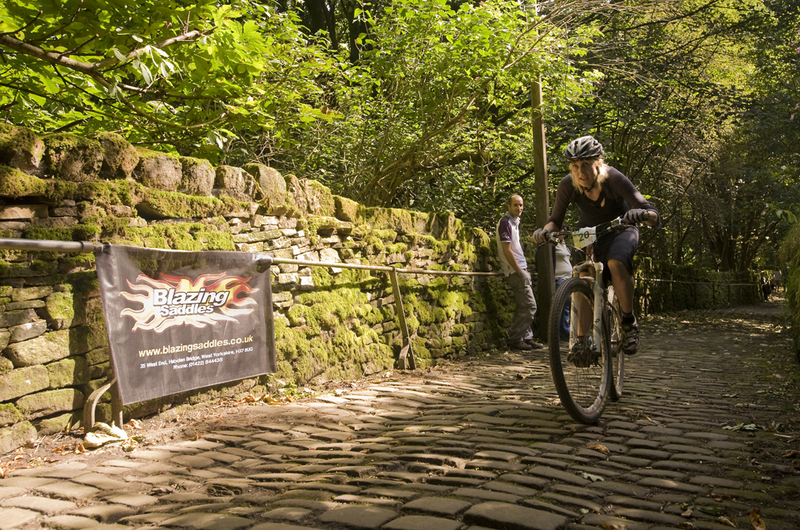 A 400 yard challenging hill climb on the steepest cobbled road in West Yorkshire and open to all riders on any bike (as long as it’s roadworthy). Be warned – this road is so steep there is a hand rail for pedestrians. On the plus side, winners who complete in the fastest times carry away a rather impressive trophy, and there are prizes and a rather cool raffle… It’s got to be worth a go! Information about the 2014 race including photos and videos of the intrepid few, can be found here. A challenging 47 mile loop connected to the Pennine Bridleway. It can be tackled all year round, but there is an annual organised event which in 2013 celebrated its tenth anniversary. Basic maps of the route can be downloaded here. Alternatively you can buy the pocket book giving detailed advice and information, route guidance and description from Blazing Saddles, which is small enough to take with you should you wish. It also describes the route in both directions; clockwise and anticlockwise which can prove pretty useful. More details and an entry form for 2015 can be found here. In aid of Sue Ryder , the Challenge has 3 options – Charlotte, Emily or Anne. Charlotte is a 27 mile ‘extreme challenge route’, including a brand new section of the Pennine Bridleway. Emily is an intermediate route of 23 miles and is a mix of tracks, trails and minor roads. Anne is a beginner’s ride suitable for families and children, and is approximately 11 miles long. More details, contact numbers and to view the routes click here. As the title suggests, 26 miles of challenging terrain with approximately 3,800 feet of climbing. Aim to complete it in around 3.5 hours and you’ll be doing well… Further details here.